5 8 P R I N T W E A R M A R C H 2 0 1 9 USING AN ILLUSTRATOR TEMPLATE In this next example, we are using an Illus- trator template with the same dimensions as the previous CorelDRAW example. The Il- lustrator print dialogue shows the use of se- lecting the 'custom' page size option, which will automatically size the output file to be the same as the original document tem- plate. It is important to understand that the document size used to design the artwork and the PostScript print size are not always the same. Using 'custom' ensures that the artwork document size is used. 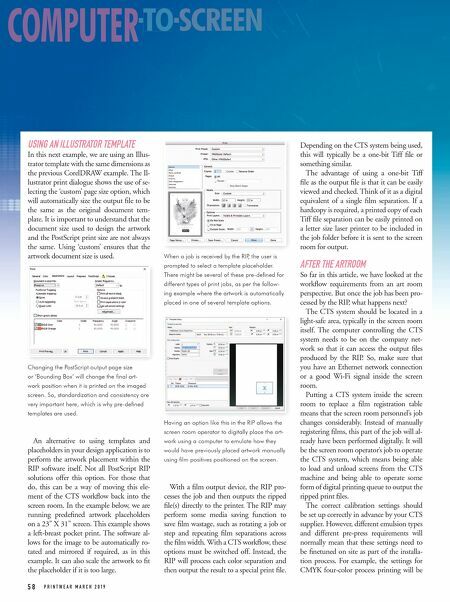 An alternative to using templates and placeholders in your design application is to perform the artwork placement within the RIP software itself. Not all PostScript RIP solutions offer this option. For those that do, this can be a way of moving this ele- ment of the CTS workflow back into the screen room. In the example below, we are running predefined artwork placeholders on a 23" X 31" screen. This example shows a left-breast pocket print. The software al- lows for the image to be automatically ro- tated and mirrored if required, as in this example. It can also scale the artwork to fit the placeholder if it is too large. With a film output device, the RIP pro- cesses the job and then outputs the ripped file(s) directly to the printer. The RIP may perform some media saving function to save film wastage, such as rotating a job or step and repeating film separations across the film width. With a CTS workflow, these options must be switched off. Instead, the RIP will process each color separation and then output the result to a special print file. Depending on the CTS system being used, this will typically be a one-bit Tiff file or something similar. The advantage of using a one-bit Tiff file as the output file is that it can be easily viewed and checked. Think of it as a digital equivalent of a single film separation. If a hardcopy is required, a printed copy of each Tiff file separation can be easily printed on a letter size laser printer to be included in the job folder before it is sent to the screen room for output. AFTER THE ARTROOM So far in this article, we have looked at the workflow requirements from an art room perspective. But once the job has been pro- cessed by the RIP, what happens next? The CTS system should be located in a light-safe area, typically in the screen room itself. The computer controlling the CTS system needs to be on the company net- work so that it can access the output files produced by the RIP. So, make sure that you have an Ethernet network connection or a good Wi-Fi signal inside the screen room. Putting a CTS system inside the screen room to replace a film registration table means that the screen room personnel's job changes considerably. Instead of manually registering films, this part of the job will al- ready have been performed digitally. 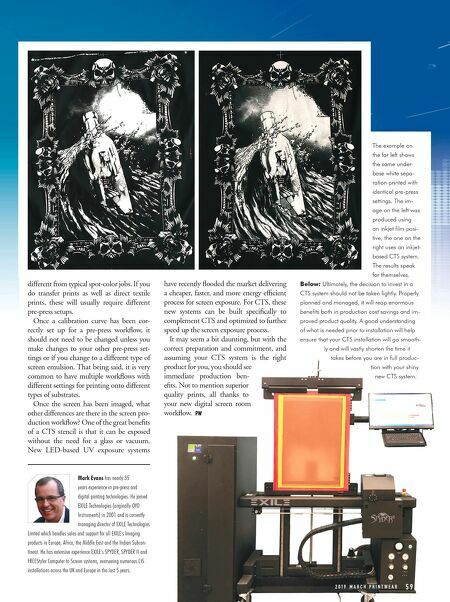 It will be the screen room operator's job to operate the CTS system, which means being able to load and unload screens from the CTS machine and being able to operate some form of digital printing queue to output the ripped print files. The correct calibration settings should be set up correctly in advance by your CTS supplier. However, different emulsion types and different pre-press requirements will normally mean that these settings need to be finetuned on site as part of the installa- tion process. For example, the settings for CMYK four-color process printing will be COMPUTER - TO - TO - - SCREEN Changing the PostScript output page size or 'Bounding Box' will change the final art- work position when it is printed on the imaged screen. So, standardization and consistency are very important here, which is why pre-defined templates are used. When a job is received by the RIP, the user is prompted to select a template placeholder. There might be several of these pre-defined for different types of print jobs, as per the follow- ing example where the artwork is automatically placed in one of several template options. Having an option like this in the RIP allows the screen room operator to digitally place the art- work using a computer to emulate how they would have previously placed artwork manually using film positives positioned on the screen.